3D printing, or additive manufacturing, is having a revolutionary impact on product design and manufacturing. The technology is not only transforming how things are made, but also how things are designed, and how business is done. As the technology continues improving, the availability of materials is growing, and the cost of getting on board with the technology is going down. 3D printing is beginning to touch aspects of our everyday life, sometimes in ways most of us aren’t even noticing. Those who view additive manufacturing as a kind of fringe or niche technology might be surprised to learn of the range of industries now regularly making use of it. Within the next decade, every commercial airliner is likely to be using 3D printed parts. It’s being used in the medical industry, in automobiles, industrial manufacturing, for prototyping, and for end-use parts in all manner of industries. The increased efficiencies of additive techniques are having a transformative effect on the product design workflow. Additive manufacturing is changing how products are manufactured. It’s also changing where. 3D printing is contributing to a global economic shift, which is seeing a return of manufacturing to the United States. It’s no secret that over the past couple decades, U.S manufacturing has experienced a significant decline as firms move overseas to take advantage of lower labor costs. A tool made in China or Vietnam can cost anywhere from $10,000 to $50,000 less than a tool made in the U.S or in other affluent nations, largely because workers are paid less. This has led to some challenges, though, as the increased distances involved in product development have given rise to certain complications. Long lead times, high import and export costs, shipping costs, and inventory costs combined with sole-sourced suppliers and the problem of working with manufacturers that are distant and often never seen in person have created a less than optimal context for new product design. On top of this, consumer consciousness regarding issues like climate change and a desire to support local economies have added a kind of moral incentive for companies that can produce domestically. Additive manufacturing is emerging as a solution to many of the challenges that have cropped up in offshore manufacturing. The manufacturing landscape is changing, and the industry is moving back onshore. 3D printing is not the sole driver of this trend, but the ability to produce more complex designs, the dramatically improved lead times, and the increased efficiencies of the technology are contributing to the return of manufacturing to the U.S. The labor market is different now than it was during the manufacturing exodus. Factories now are driven more by technological innovation and engineering expertise than by human labor. Industry leaders are increasingly adopting 3D printing technologies. According to the 2015 Wohlers Report (the prominent annual report on the state of 3D printing), the use of additive manufacturing services grew almost 40% between 2013 and 2014. This is reflective of the fact that industries are recognizing the profitable potential of 3D printing. One of the most significant impacts additive manufacturing is making on product development is in the prototyping phase. With conventional manufacturing, a functional prototype that approximated the performance of the end-use product would have to be tooled. In the case of offshore manufacturers, the prototypes would then have to be shipped back to the designers. Any changes to the design would require retooling and a new production run. 3D printing changes all that. Designers can now have prototypes produced locally and immediately, without any tooling. Prototypes can be easily iterated, allowing designers to take risks and make mistakes early in the design process without incurring heavy costs or long delays in production. This new paradigm also allows designers to get feedback from customers early on. By the time the product is ready for full production, all the kinds have been worked out and fully tested. The adoption of additive manufacturing also represents a transition away from traditional physical product inventory towards a virtual inventory. The digital files used to generate 3D printed objects are much easier and cheaper to store than physical objects. This allows firms or designers to easily revisit earlier products and revise them. It’s no longer necessary to hold on to tools or tooling aids, freeing up inventory space and making organization that much easier. While the costs of getting into 3D printing have been dropping considerably, the initial expense of acquiring the necessary equipment remains the largest barrier to adoption. Outsourcing offers an elegant solution to that problem. The availability and capabilities of in-house additive manufacturing technology continue to expand. 3D printers capable of producing functional prototypes and end-use parts are increasingly being adopted by firms in all kinds of industries, and also by individuals and independent designers for use in their own homes or small businesses. This trend will certainly continue, as the cost of the technology keeps going down. That said, outsourced providers are still providing a valuable service. The most obvious advantage provided by outsourced 3D printing is that it allows individuals or companies to access cutting-edge technology that might not be otherwise affordable. This is particularly valuable given the rate at which the technology is improving. Someone might invest a great deal of money into what is today a top-of-the-line system, only to see it surpassed in a few years by something even more powerful. Meanwhile, that system that they invested so heavily in is likely to be substantially less expensive a few years from now. For companies that specialize in providing 3D printing services, the equation is different. It makes sense to invest in the latest and greatest technology when that is the operating principal of your business. In other words, outsourcing provides a model which involves less investment risk for all parties. 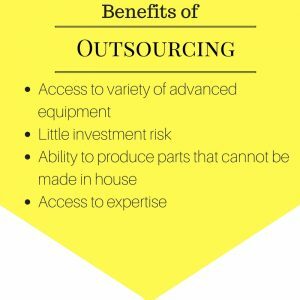 An equally valuable benefit of outsourcing that is perhaps less obvious is the access it provides to expert personnel with a deep knowledge of additive manufacturing. Outsourcing is not only useful as a strategy for accessing technology, but for accessing expertise. Even firms that have the financial resources to purchase their own advanced additive systems often prefer to outsource certain tasks. This is especially true for technologies that involve more post-processing, like Laser Sintering and Direct Metal Laser Sintering. 3D printing metals requires a skilled team and sometimes additional equipment for processing that makes it difficult to implement in-house. Sometimes outsourcing still makes sense even for firms that have invested in in-house 3D printing technologies. Sometimes outsourcing still makes sense even for firms that have invested in in-house 3D printing technologies. Outsourcing will stay relevant into the future too, as additive manufacturing is increasingly used for end-use parts. Outsourcing providers have the expertise and the technology to produce the high degree of quality required for final production parts. Slowly but surely, 3D printing has been transitioning from a method of producing visual aids and prototypes to a technology that is capable of manufacturing end-use parts. While 3D printing is still viewed by some as being used primarily to produce models and trinkets, the reality is that additive manufacturing is now being used for functional parts in a variety of industries. The widespread adoption of 3D printing is most visible in the aerospace and automotive industries. These were some of the first industries to adopt 3D printing for end-use parts in the first place, and so they have the most accumulated experience. The ability for additive technologies to produce single, lightweight pieces with complex internal geometries is particularly valuable for these industries. Technologies like Laser Sintering and Fused Deposition Modeling (FDM) allow for parts to be printed using materials that are nearly or completely identical to production-grade materials used in conventional manufacturing. Metal printing is one of the most exciting and highly-valued technology, and its use is expanding hugely with a great deal of applications across industries. High-temperature plastics and rubber-like materials are also in high demand for final production parts. Carbon fiber 3D printing is expanding horizons for the automotive and aerospace industries. One of the most fascinating developments in 3D printing has been the development of bio-based materials for use in the medical industry. Not only can 3D printing produce FDA approved materials for medical applications, but engineers have been able to 3D print stem cells, artificial blood vessels, and even miniature organs for testing vaccines. 4D printing is also pushing the frontiers of additive technology. If you’re interested in taking advantage of outsourcing 3D printing, Cad Crowd is the place to be. We connect you with leading U.S based manufacturers for any scale of production or prototyping. We also offer CAD design and 3D printing design services so that you can create the 3D printable files you need to bring your design to life. Get a free quote. 3D print technology has given different perspective to see towards the engineering. It has changed the way for the innovation. It has made easy to make small design models .